There is no denying, I am a dog person. I have always been drawn to dogs and have felt a deep, perhaps you could call it spiritual, connection towards canines. Thus, it is easy to feel that same connection towards wolves and coyotes. But it goes beyond the human-dog relationship. Undomesticated “dogs” play a critical role in the environment. This is a proven fact. Unfortunately, facts are often no match for the power of ignorance. Fact struggle to gain ground when misinformation is so easily passed down and spread. 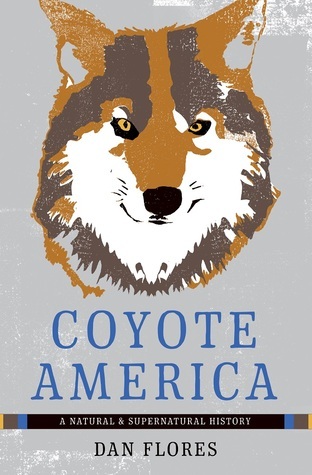 Dan Flores’ Coyote America showcases this sad truth, but also covers a lot of interesting ground of both the natural and spiritual history of coyotes. Coyotes were once revered. Native American people had numerous stories about “Old Man Coyote” and they respected the cunning animals as skilled predators. These stories set the stage for the coyote’s rapid and recent fall from grace. From a deity to enemy number one, the “archpredator” of North America. The U.S. government set about a war on coyotes with the ultimate goal of total extermination. Predators in general were vilified and thought to be of no use to the ecosystem. On the contrary, they were detrimental to “good” animals, essentially code for “animals hunters wanted to shoot”. *With the automobile gaining usage there was less need for horses for travel. Or simply, it looked like the coyotes were struck by lightning. And as for the pain, I can only imagine. Flores personifies the coyote, calling the coyote’s howl “the original national anthem of North America, a canine ‘Star-Spangled Banner’…”. Yet others viewed the howl as “manic” and “lunatic”. Coyotes (plus wolves and mountain lions) needed to be exterminated solely because they were predators. Aldo Leopold was able to change a once negative view towards predators, realizing “that a predator-free ‘paradise’ contained a fatal non sequitur.” Coyotes and wolves had lived with “game” animals for millennia yet had failed to “wipe out its own mammalian food supply”. Unfortunately, these ideas fell on deaf ears and the process to exterminate continued. The most important and yet still mostly ignored studies of coyotes came from Adolph Murie. Adolph researched coyotes in the field for two years and then in 1940 published Ecology of the Coyote in the Yellowstone. This study proved that coyotes had hardly any negative impact on the other mammals of the area. On the contrary, they greatly benefit the ecosystem as a whole. The use of strychnine wasn’t enough; no matter how much baited traps the coyotes continued to thrive. Flores explains this well; how coyotes reproduce to carrying capacity and have a knack for moving into places ironically closer to human settlement. Thallium sulfate and sodium fluoroacetate were added to the mix. Millions of dollars and millions of dead coyotes later, coyotes still continued on. In 1957, the combined budget for killing coyotes was $4.5 million. Thallium sulfate killed slowly and was odorless, making it more “useful” for killing. Other coyotes failed to see the connection to the dangerous bait so couldn’t learn from it. Warning! The description below is graphic. Skip it if you want. Coyotes that fed on a carcass baited with thallium sulfate went blind. They lost the pads on their feet. Their pelage dropped off in tufts. Naked coyotes poisoned by thallium sulfate were sometimes found huddled together, freezing and blind but not yet dead. Sodium fluoroacetate was equally deadly and disgusting. Stories of ecological destruction repeat over and over again. Science proves one thing but more powerful sources ignore the facts. Blatant ignorance drives wildlife to or near extinction and entire ecosystems suffer. If we are lucky, the animals are brought back, like wolves to Yellowstone. But the loss will never be recovered. Time and time again action is taken without any research and as science catches up or finally begins to be heard, efforts ramp up to find workarounds or loopholes. The Division of Wildlife (Dis)Service continues to murder predators with real collateral damage. Countless other animals are harmed. As are people and pets. Coyote America is essential reading not for those who admire predators or the canine link to their own dogs. It is for everyone who cares even slightly for what is right for the environment and right for the future. This book isn’t some poetic reminiscence of what once was or a romantic view for creating a utopia. It is much beyond that. We need working ecosystems. We need predators. We need coyotes.